Imperial Oil’s Canada Fuels Operations division recently gave Cando Rail Services the Silver Award for its excellent safety record at the IOL Strathcona refinery. The annual awards were given out at Imperial’s Western Contractor Safety Forum and several Cando supervisors and staff attended. Strathcona refinery, with over 80,000 exposure hours in 2016. A total of 23,460 railcars were loaded at the refinery last year and each of these railcars was handled multiple times by Cando, from their empty arrival to when they were fully loaded and handed off to either CP or CN. Cando Rail Services earned Imperial Oil’s Silver Award for Contractor Safety. 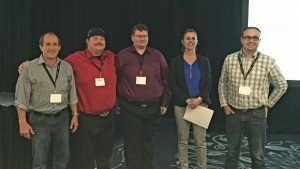 From left: Laurie Quilichini, Cando General Manager, Operations, Western Canada; Colin Haight, Cando Safety Supervisor; Adam Lazaruik, Cando Safety Supervisor; Marie (MC) Bouchard, Manager, Canada Fuels Operations for Imperial Oil; and Cody Birkett, Cando Superintendent of Operations for IOL. With over 200 contractors working for the Canada Fuel Operations division, gold, silver and bronze awards are given to contractors in both the west and the east each year. IOL’s safety performance is among the best in the Canadian energy industry and the company sets rigorous operating standards for itself and its contractors.